Are you on a Bonded pair? Your error table is clean, but the IP/Profile is definitely showing that may possibly need to go with a Bonded pair. As for the dlink gaming router, I really see no need to use it, because personally what is it going to do, other than if you want to separate a set of computers on the LAN behind a wall, that other devices that you do not want them to have access to. Bonded pair - no idea, how do I know? 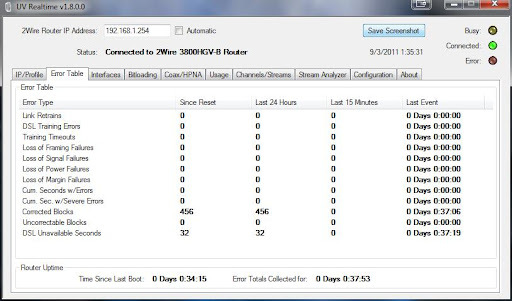 Plus I get the added benifit of UV Realtime's "usage" counter by having all my pc's and other devices behind that router. Yes, if you are having people do stuff like torrents or watching youtube, but other than that, a off the shelf router is worthless. If you want really good control for traffic shaping, check out pfSense. It is a Linux Router project, and gives more control for you, and some other things. As for bonded pair, http://www.multichannel.com/article/454799-U_verse_Gets_Into_Bonding.php Contact David about your situation with the IP/Profile tab that you are seeing. I sent you a Private Message on how to see about getting the problem that is showing in the IP/Profile tab. Something's not right ... at 2300' you should be getting at least 32 Mbps of max rate. Your line is getting you only 25 Mbps of max rate, which is 2 standard deviations below average for your distance (bottom 3% of all lines at your distance). I would wager there's a bridge tap, grounding problem, or something like that. Call tech support, have them send a premises tech, have him open a helper ticket with I&R (linesmen) to come condition the line and get the max rate up. If they can't get the max rate up, they'll have to lower the profile to 19/2 which would limit your simultaneous HD channels and maximum available internet package. The only way to get channels/streams to work behind another router is to use a switch that has a mirroring port capability in front of your router. This is what I do at home. I'll diagram this and post it here later. Are you also having issues with TVs freezing or having pixelation? The best thing to do when talking with tech support is to focus on the service problems, not necessarily the technical readings. When the U-Verse premises tech gets there then you can mention the tech readings to him. Here's a diagram showing how you can set it up so that Channels/Streams works behind another router. NetGear GS-108T Ethernet port 8 is set to be the mirror port for Ethernet port 1. Multicast packets coming into the NetGear switch on port 1 from the 2Wire RG are mirrored and repeated out port 8, which enters your LAN through port 4 of the D-Link. 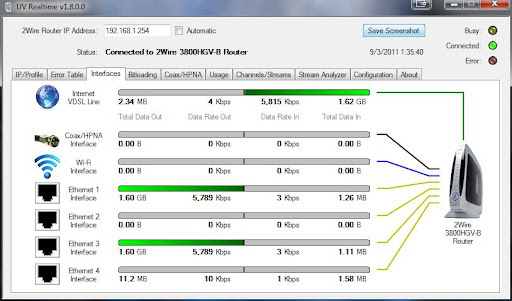 Your computers can now see the necessary multicast report packets that the STBs sent out, yet no IPTV stream comes to the NetGear switch or the D-Link thanks to IGMP snooping on the 2Wire. To make sure this works right, it's imperative that the RG's LAN is a different IP subnet than your D-Link's LAN. You probably have already set it up this way, but if it's not, your computers will bypass your D-Link when attempting to reach the Internet. If you really want to make sure nothing can bypass the D-Link, you can also configure the NetGear switch to put port 8 in a separate VLAN with a separate PVID. A tech will be out this Wednesday to check the line. So I take it that your UV Realtime does not issue an IGMP join request? 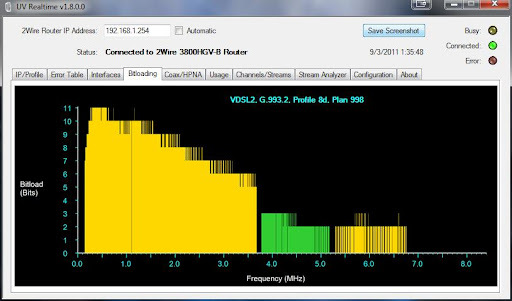 It "listens in" for the multicast traffic, is that right? Update: Premises tech's were out (they sent two). They took my 2wire gateway and ups battery backup for it and walked down to the post in the neighbor's yard and hooked it up out there. They came back, said they were still seeing the crosstalk on the line, and that they would need to open a ticket with the linemen to get it checked out and fixed. I kinda felt bad telling him that when I spoke to T2 on Monday to setup the appointment I told them to create the helper ticket then.... Oh well, he says that they will be out "probably tomorrow" to fix the line and that I should be getting a follow up call sometime in the next couple of days. Side note, they did replace the grounding block on the ATT service box on the outside of the house. Guess I'll have to see what the next couple of day's brings. 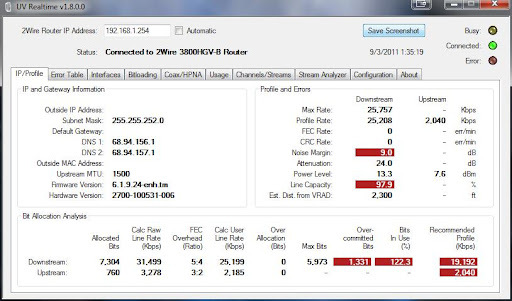 In order to have multicast packets cross a router, the router must run some type of multicast routing protocol, like PIM, or must run simultaneous routing and bridging (bridge multicast but route unicast). It's easier and requires much less configuration to simply set up the switches to bridge like I've shown. Now what? Uverse side submitted line ticket, linemen said "tested no issues" uverse side closed my ticket. Everything on UVRealtime is the same, problem still there. But this time Level 2 says "all my tests are green sir". Really?? My bitloading is awful there's still crosstalk but everything's fine?!? The next set of Uverse Techs were here again this afternoon. This time he tells me that he's un-willing to open a line ticket becuase they get in trouble if they open tickets with line and there are no issues. So instead they replaced my old original 2Wire Gateway with the new slick looking black one. As you can see my bit loading appears better than it was with the new router, but I have taken some errors now, and "ufix.att.com" still says I have an issue with my line. I just can't understand why it is that AT&T own internal Tech tools are reporting "Crosstalk" on the line, yet they are unwilling to fix it.